Apparently, the movie, Tin Cup, and the dozens of charity golf tournaments have not improved Cheech Marin's golf game. During this past weekend's Ryder Cup golf tournament, Cheech Marin and other celebrities accidentally hit spectators with golfballs. Sorry everyone, but the Cheech and Chong reunion film is on hold indefinitely. Cheech Marin and Tommy Chong loved the original script, but the powers that be (the film studio) did not. The film studio, New Line Cinema, has since left the project. The original director, Larry Charles, left the project to work on an unrelated television project. In a recent article, Tommy Chong hinted that tensions may be heating up again between he and Cheech Marin. A revised script is or was being penned by Tommy, but Cheech only agreed to make a cameo. He character would be replaced by Pedro's son. Any Cheech and Chong movie without both Cheech Marin and Tommy Chong would be an atrocity. We'll provide additional updates as we receive them. Cheech Marin and other celebs are playing in this weekend's Ryder Cup golf tournament at The Celtic Manor in Wales. Director Cheech Marin visited the set of Bela Lugosi's 1931 Dracula film to research his new film, Senor Dracula. Brett Alexander aka Tommy's friend aka the creator of the Cheech axe aka the creator of the Chong axe aka the loony man of 1001 faces recentlperformed at Soupstock. The Chongbot was also on hand. Skydivers dropped in to see the show. Brett will appearing at the Harvest Fest next. It runs Oct 7-10. Cheech Marin's new film, Underclassman, premiered in NYC last night. 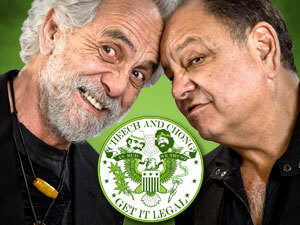 The recently released Cheech and Chong DVD Giftset was the 8th best-selling DVD this past week. The giftset consists of the Up In Smoke and Still Smokin DVDs at a great low price. The Detroit Free Press has declared Cheech and Chong's self-titled album a "must" for comedy collectors. Brett Alexander, the creator of the exquisite Chong guitar, has just completed carving the Cheech axe. This is his best work yet. No word on when it will be for sale to the general public. Brett has also completed work on his new comedy album, Cheeb and Bong's Best Hits. It's an awesome compilation of Brett's best comedy bits. For those of you that didn't know, Cheech Marin is on the board of the Hispanic Scholarship Fund. The organization donates $30 million in scholarships yearly. AKA Tommy Chong, a documentary about Chong being arrested and sent to prison for selling bongs via the internet, will be shown at next month's Toronto International Film Festival. The film was directed by Josh Gilbert. CNN interviews Cheech Marin regarding his Chicano Visions art collection. Underclassman, starring Nick Cannon, Shawn Ashmore and Cheech Marin premieres this Friday. This film is about a detective that goes undercover at a private school to bust a stolen car ring. Cheech Marin is the police captain. Update: release postponed til Sept.
A photo has been posted of Tommy at a July 29th Fox celebrity party. Cheech Marin will be directing Latinologues when it comes to Broadway's Helen Hayes theater September 13th. The play, which is written by and stars Najera (Mad TV and In Living Color) , has been touring the country with a revolving group of actors. Performances begin September 13th, but the show offically launches October 23rd. It's a 12-week engagement, ending December 4th.